Shafie thanking his supporters outside the court complex minutes after the court declare him as the rightful chief minister. 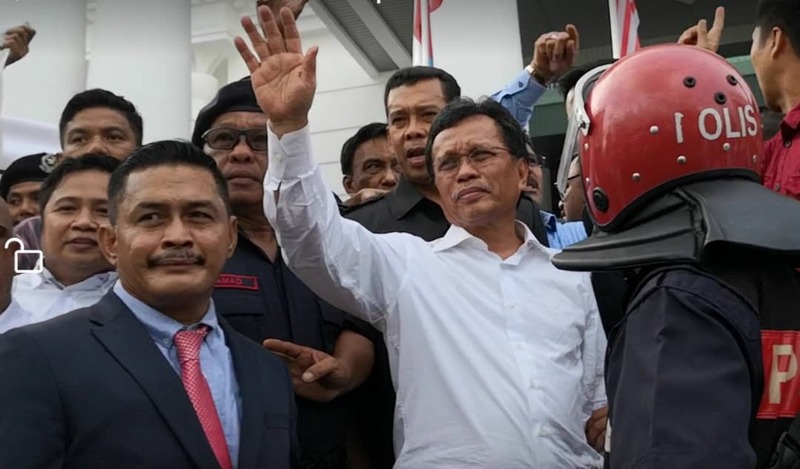 KOTA KINABALU: Sabah Police Commissioner Datuk Omar Mammah has urged all parties to accept the result of the court following the declaration of Parti Warisan Sabah president Datuk Shafie Apdal as the rightful state chief minister. Speaking to reporters after the court proceeding, Omar also thanked both supporters from Warisan Sabah and Barisan Nasional for keeping peace and abiding to police instruction. “Today’s proceedings went smoothly without any untoward incident. “We had mobilized our personnel to guard the court complex, including road s at the entrance of the court. “So far, all went well without any incident,” he said. When asked if police received any information of an alleged protest that may be starged by certain party, Omar said police have not received any such information. “We will monitor the situation but like I said, please respect the result from the court,” he said. The High Court here today dismissed Tan Sri Musa Aman suit against The Head of State (TYT) and Sabah Chief Minister (CM) Datuk Shafie Apdal, who sought a declaration that he (Musa) was the rightful CM. The court ordered Musa, who is Sungai Sibuga Assemblyman to pay RM15,000 cost to TYT and another RM15,000 cost to Shafie.